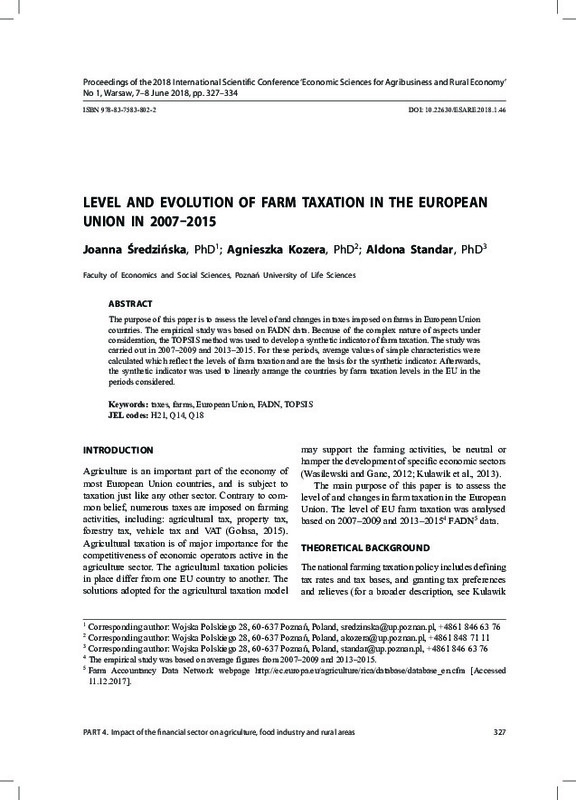 The purpose of this paper is to assess the level of and changes in taxes imposed on farms in European Union countries. The empirical study was based on FADN data. Because of the complex nature of aspects under consideration, the TOPSIS method was used to develop a synthetic indicator of farm taxation. The study was carried out in 2007–2009 and 2013–2015. For these periods, average values of simple characteristics were calculated which reflect the levels of farm taxation and are the basis for the synthetic indicator. Afterwards, the synthetic indicator was used to linearly arrange the countries by farm taxation levels in the EU in the periods considered.